Billions is an American 60 minute scripted crime television series, which kicked off on January 17, 2016, on Showtime and is broadcast every Sunday at 21:00. The show is currently in its 4th season. Showtime is yet to announce the renewal of Billions for Season 5 as well as its cancelation. Sign up to track down the show's status and its release date. 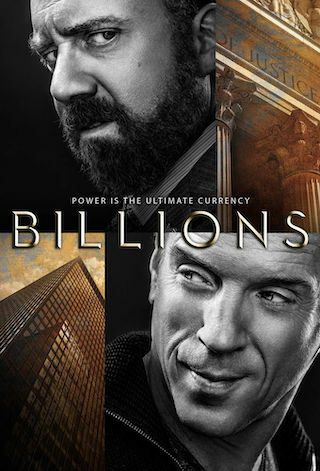 Billions is a complex drama about power politics in the world of New York high finance. Shrewd, savvy U.S. Attorney Chuck Rhoades and the brilliant, ambitious hedge fund king Bobby "Axe" Axelrod are on an explosive collision course, with each using all of his considerable smarts, power and influence to outmaneuver the other. The stakes are in the billions in this timely, provocative series. On December 19, 2018, Showtime officially confirmed the exact release date for a fourth season of Billions, which premiere is scheduled on March 17, 2019 at 9p/8c. Don't miss the premiere! Track Billions on RD V2.0! When everyone is out for revenge, no one is safe. This is never more true than in season four of BILLIONS. Bobby Axelrod (Lewis) and Chuck Rhoades (Giamatti), former enemies, and Wendy Rhoades (Maggie Siff), the chief counselor to each, have come together to form an uneasy but highly effective alliance, aimed at the eradication of all their rivals, including Grigor Andolov (guest star John Malkovich), Taylor Mason (Asia Kate Dillon), Brian Connerty (Toby Leonard Moore) and Waylon "Jock" Jeffcoat (guest star Clancy Brown). Ambition and betrayal have long been at the heart of BILLIONS, and this season all the characters find out exactly how high a price they'll have to pay to satisfy those needs.